Once you’re on the hilltop, you’re in Topper Territory, a land rich in university traditions and Hilltopper pride! 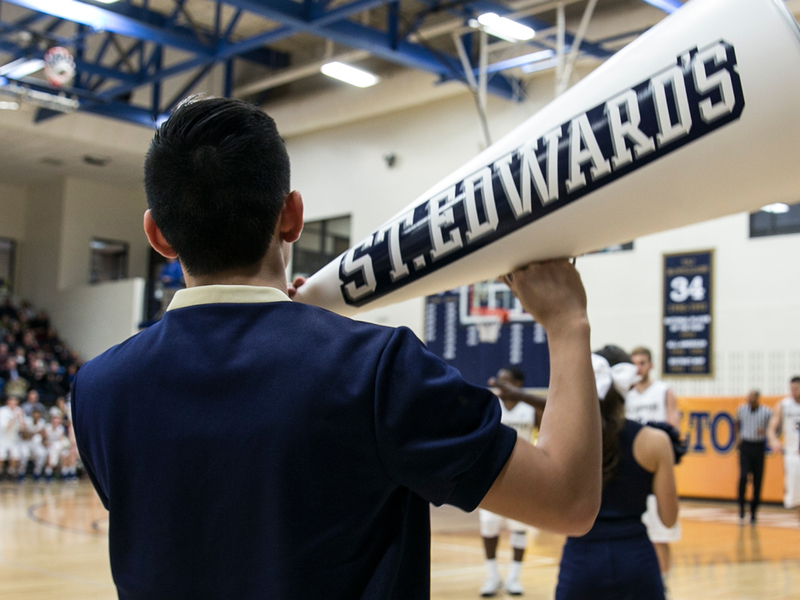 Show your school sprit by participating in our university traditions, cheering on our athletes, following our mascot Topper and wearing your St. Edward’s gear. Our identity, character and optimism are demonstrated in campus rituals and celebrations that reflect the welcoming spirit and generosity that defines our Holy Cross educational experience around the world. Hilltoppers’ lifelong connection to each other, the St. Edward’s community and our Holy Cross values is captured in the symbolizism of the University Ring. Each year, graduating students honor this distinction at the University Ring ceremony held under the Sorin Oak. 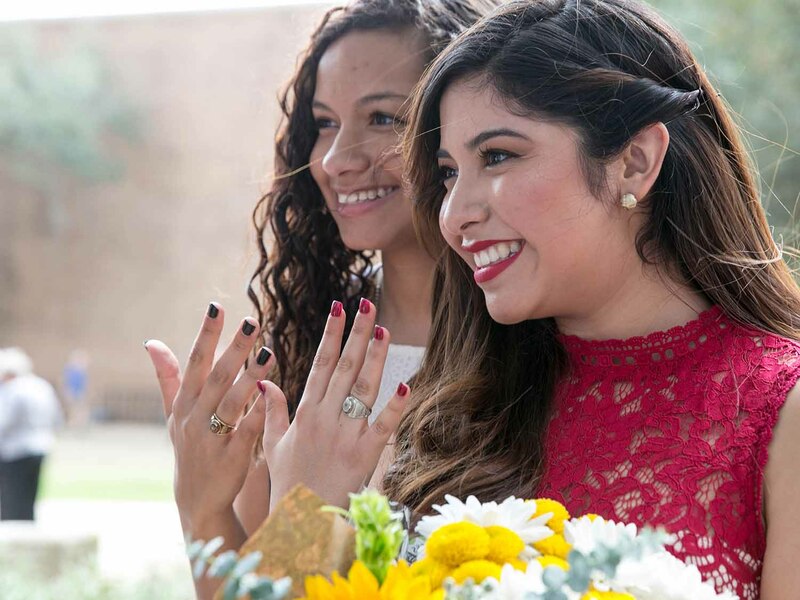 Get details on the history, tradition and ordering of your class ring. Being a Hilltopper means being a part of many traditions that connect you to your fellow classmates, faculty and alumni. Here’s a preview of some of our beloved traditions that will shape and guide your St. Edward’s experience. The 12-member Heartland Conference covers a lot of ground — four states (Arkansas, Kansas, Oklahoma and Texas) that total more than a half-million square miles of the U.S. Supporting your Hilltopper teams is a great way to discover the Heartland beyond Austin. Learn more about Hilltopper Athletics and about Topper. Follow Topper on social media to find out about Topper pride events happening on campus. 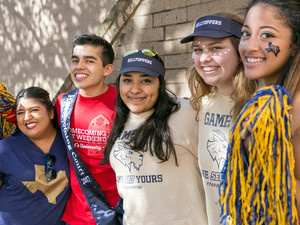 Gain a sense of Hilltopper pride and tradition by participating in these spirited activities, organizations and events. On Tuesdays, we wear St. Edward’s University blue and gold! 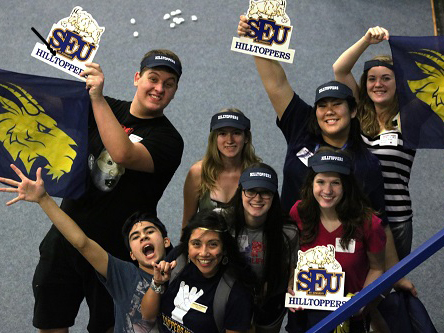 Wear your SEU gear every Tuesday and enjoy great discounts — just for being a Hilltopper. Interested in partnering with us to provide a discount on Topper Tuesday? Fill out the Community Partner Participation Form. A passionate fan and supporter of all things St. Edward’s. 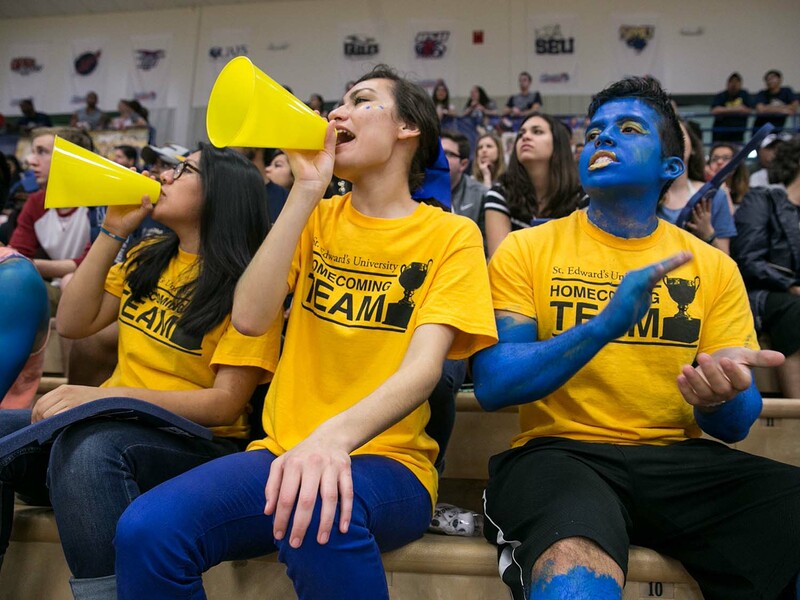 From cheering at athletic games, to being the loudest group at any St. Edward’s University event, Hillraisers “bleed” blue and gold. Come to the next Hillraisers Huddle, where we get ready and pumped just before the games. List “Hillraisers” as a Student Org in your Topper Pride app profile. Subscribe to the weekly newsletter to get information about upcoming Hillraisers events! Go to the Hilltopper Athletics to see game schedules for every sport. All games are free entry with a valid SEU ID. Need more information? Email us at spirit [at] stedwards.edu. Battle of the Saints is an annual athletic competition between St. Edward’s University and St. Mary’s University, our biggest rival. 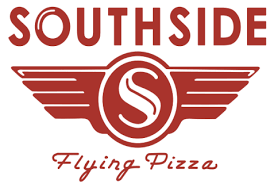 Each year, the two schools compete against each other in 11 different sports (men’s and women’s soccer, volleyball, men’s and women’s basketball, men’s and women’s tennis, men’s and women’s golf, baseball and softball) earning a point for each competition they win (women’s golf is decided by whomever finishes higher in the Heartland Conference Tournament; men’s golf plays a preseason match-play scrimmage). The school with the most points at the end of the academic year wins Battle of the Saints. Check out the complete game schedule for all home and away matches with St. Mary’s, and make your plans to attend. Keep an eye on the St. Edward’s events calendar, too, for upcoming games and details about Hillraiser Spirit Parties, where you can pick up a BOTS (Bring on the Saints) shirt, face tattoos and banners. 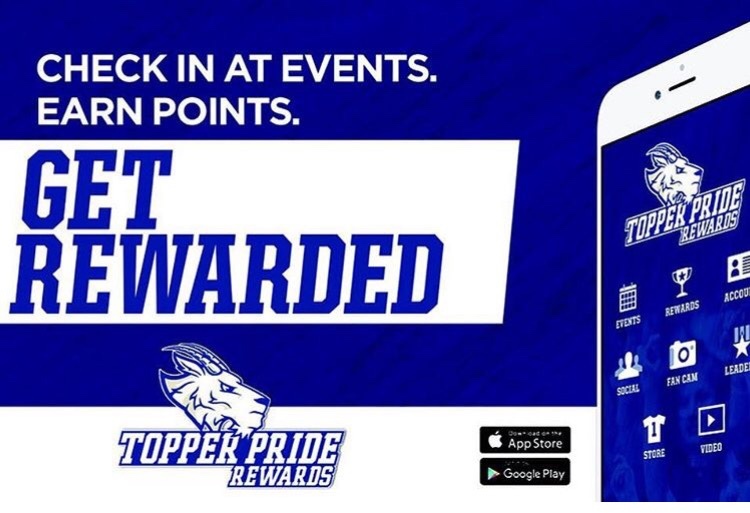 Get the most up-to-date game and rewards information by downloading the Topper Pride app on iTunes or Google Play. 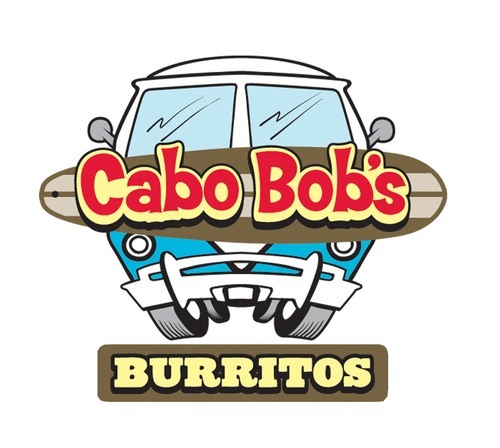 Earn points at all home games and select campus events, and redeem your points for awesome rewards! The St. Edward’s baseball team is made up of 57 players, three coaches and one special star that holds the team together by always reminding his teammates how blessed they are to play the game. Read about how Brandon Gonzales’ optimism and determination inspire and support his comrades.